Delivering quality chiropractic care to the Maryville area since 1982. 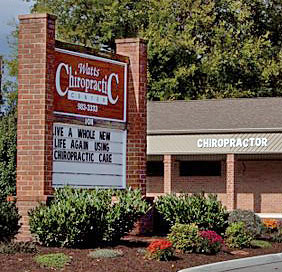 Watts Chiropractic Center was initially opened in Knoxville in March of 1982, and moved to Maryville in June 1987. We chose East Tennessee, especially Maryville, for the mountains, the friendly people, outdoor activities and good schools and colleges. With over three decades of experience has truly enjoyed establishing long-term relationships with his Maryville patients and their families – many patients we have seen for over 25 years! At Watts Chiropractic Center we offer an experienced (combined over 40-years experience) and professional staff, including a licensed chiropractic therapy assistant and a licensed chiropractic X-ray technician. When many people seek care in our Maryville practice they have one goal: relief. So that’s where we start! Once you are feeling better, many of our patients want to stabilize and rehabilitate any weakness that may have caused their problem in the first place. We refer to this as the “pick and shovel” work because it can build the foundation for a healthier future. Dr. Watts and our team encourage patients to achieve the highest levels of health they can. Through educational opportunities (like this website), and weekly Wellness Workshops on a variety of health topics for patients and guests (i.e. stress, spinal exercise, nutrition, and occasional guest speakers), we hope to communicate the value of ongoing chiropractic care. Ready to get started? Call our Maryville chiropractic office and request an appointment today!